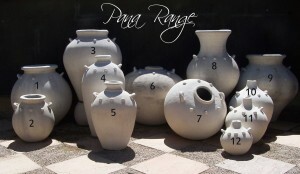 This beautiful set of pots (Pana Range) will be a great attraction for your customers. Ranging in size from 1050mm to 360mm (no. 3 and no.12) tall and 950mm to 350mm wide (no.9 an no. 12) wide, there is something for every type of customer that visits you. Our Round Planters range is a set of 19 different pots. Varying in size from 750mm as the tallest pots (no. 3 and no. 12) to 300mm as the shortest (no. 4 and no.16) The widest is no. 12 at 910mm. 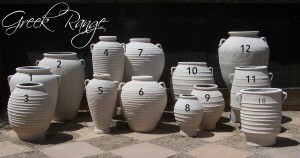 This is a unique collection of pots that we are sure will meet the needs of your varied client base. This classic range of pots (Greek Range) has always been a favorite with customers. We gave them an overhaul though to give them a slightly modern touch. We are confident that as always this range will be a great seller. Varying in size from 1200mm as the tallest pots (no. 4) to no.8 at 520mm as the shortest. The widest is no. 12 at 800mm.